Congratulations to Emma Newcomb and Liz Piotrowski on receiving fellowships from the UMaine Center for Undergraduate Research (CUGR)! Both Emma and Liz were named AY 2018-19 CUGR Fellows. Their fellowships will support research in: “Effects of human interaction on marine mammal strandings and call reports in the Gulf of Maine from 2010 to 2015” (Emma) and “Using eDNA sampling as a mechanism for improving marine mammal conservation through a non-invasive and cost efficient technique” (Liz). Recruiting PhD student in ecological genomics… of birds! As part of a new, collaborative NSF-funded research and training program in the genomic ecology of coastal organisms, we are recruting a PhD student who will study genome-phenome relationships in the wild. The student will be expected to conduct both field work and genomic analyses towards understanding adaptation and the links between plumage phenotypes (color, resilience to wear, and microbiomes) and reproductive fitness across sparrow species. Field work during summer months may involve supervising field crews in tidal marshes across the Northeast US, from Maine to Virginia. Genomic analyses will include candidate gene sequencing, gene expression analyses, and microbiome characterization. The student will be co-advised by Drs. Kristina Cammen (http://cammenlab.org) and Brian Olsen (https://sbe.umaine.edu/olsen-2/), through the Ecology and Environmental Sciences program at the University of Maine, located in Orono, an hour to the ocean and an hour and a half to Maine’s highest peak. The student will also have the opportunity to work in collaboration with a diverse team of investigators, graduate students, and undergraduate students at the Universities of New Hampshire and Maine studying the ecological genomics and eco-evolutionary feedbacks of adaptation in tidal marsh birds. The successful candidate must have a strong background in ecology and/or genomics. Preferred candidates will have demonstrated experience with field work, in particular, bird mist-netting (previous time as a federal banding sub-permittee strongly preferred), as well as experience in genetics, genomics, and/or bioinformatics. Consistent with our program scope and to advance an integrated understanding of adaptation in nature, we are especially interested in candidates who show promise to work in an inclusive and diverse collaborative environment and to engage intellectually across the diverse scales of genomes, phenomes, and environmental feedbacks. Individuals who are intellectually curious, responsible, willing to learn, team-oriented, and have attention to detail are encouraged to apply. An M.S. in a related field is preferred, but qualified candidates with extensive experience will be considered. To apply, please send a cover letter describing your qualifications, including your commitment to diversity and inclusion in collaborative science, a curriculum vitae, unofficial transcripts, and the contact information for at least three references to kristina.cammen@maine.edu and brian.olsen@maine.edu with “Ecological Genomics PhD Student Search” as the subject line of your email. All applications received before November 14, 2018 will receive full consideration, and applications will be accepted on a rolling basis thereafter until the positions are filled. A start date of January 2019 is strongly preferred. The Cammen Lab welcomes their newest member, Alayna Hawkins, who begins an MS in Marine Biology program this summer. A recent graduate of St. Francis College in Pennsylvania, with an interest in marine mammal science and genetics, Alayna joins the lab to conduct research on gray and harbor seal immunogenetics. She hopes to help elucidate why gray seals appear more resistant than harbor seals to several viral diseases through an exploration of the genetic diversity of their immune systems. 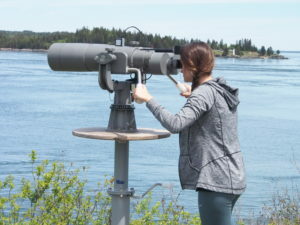 Liz Piotrowski scans for marine mammals in Western Passage using BigEyes. 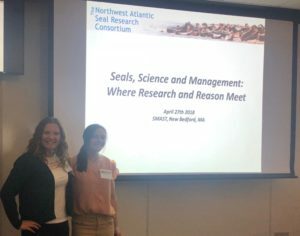 This summer, undergraduate research assistants, Emma Newcomb and Liz Piotrowski, are leading a shore-based marine mammal visual monitoring program in Western Passage, a promising site for future tidal energy power. Once a week, they travel to Eastport, ME to conduct a 4-hour visual observation period, which later this summer will be supplemented by passive acoustic monitoring for marine mammal vocalizations (led by Chris Tremblay in Gayle Zydlewski’s lab). In their first month of observations, Emma and Liz have observed harbor porpoise, harbor seal, and minke whale. 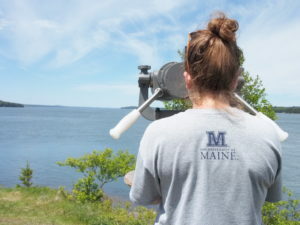 Emma Newcomb looks out over Western Passage in search of marine mammals. This research is conducted in collaboration with Ocean Renewal Power Company. 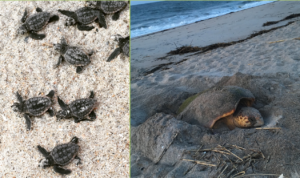 Emma’s summer internship, which also includes a historical analysis of marine mammal stranding rates in Maine, is funded by the SEA Fellows program. This week three undergraduate students in the Cammen lab presented their research at UMaine student research symposia. Please join us in congratulating the students for their excellent poster presentations! 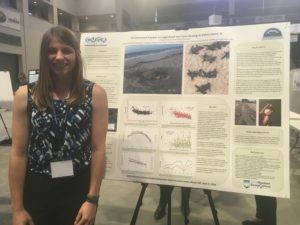 Faythe Goins presented her honors thesis research, Environmental Impacts on Loggerhead Sea Turtle Nesting on Edisto Island, SC, at the 2018 UMaine Student Symposium and won best poster presentation in Natural Sciences! She also presented her research at the School of Marine Sciences Capstone Symposium, and will publicly defend her thesis next week. 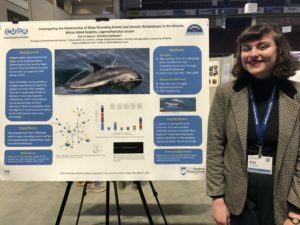 Kai LaSpina presented preliminary results from her Capstone research, Investigating the relationship of mass stranding events and genetic relatedness in the Atlantic white-sided dolphin, Lagenorhynchus acutus, at the 2018 UMaine Student Symposium. Stay tuned for future results and presentations of Kai’s research! Sarah Vincze presented her senior Capstone research, An analysis of bottlenose dolphin (Tursiops truncatus) unusual mortality events along Florida’s Gulf of Mexico coastline in association with Karenia brevis blooms, at the School of Marine Sciences Capstone symposium. With the start of a new year and a new semester, it’s time to welcome new and returning members of the Cammen Lab. This semester, Emma Newcomb, Sarah Burton, and Holland Haverkamp have returned to the lab to continue their research on marine mammal stranding rates in Maine. Kai LaSpina is continuing her research on genetic relatedness of mass stranded Atlantic white-sided dolphins. Sarah Vincze continues her Capstone literature review on the effects of HABs on bottlenose dolphins and is back in the lab, after a semester at the Darling Marine Center, to collaborate on various marine mammal genetics projects. 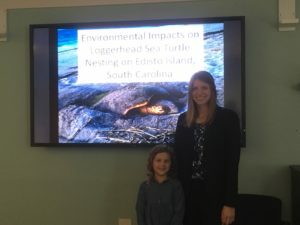 Faythe Goins is preparing to defend her Honors thesis on loggerhead sea turtle nesting trends in South Carolina later this spring. This semester, we also welcome two new members: Emma Spies, a freshman UMaine Top Scholar, who will be initiating a project on immunogenetic diversity in gray and harbor seals, and Liz Piotrowski, who is starting her Capstone research on Atlantic white-sided dolphin sightings in the Gulf of Maine. It’s exciting to have a great group of students involved in our research and we all look forward to a productive semester! You can learn more about these students and opportunities to join the Cammen Lab here.